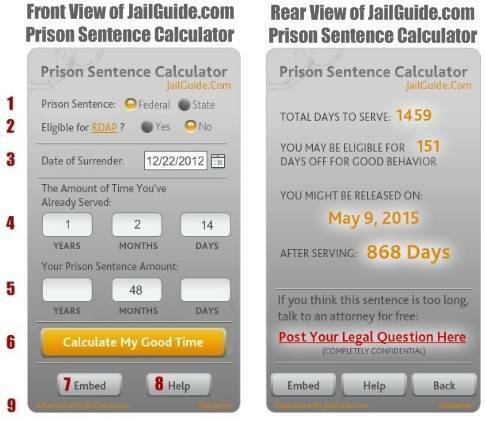 Using the Jail Guide Prison Sentence Calculator is simple and we have included detail instructions to calculate the amount of prison time which may be reduced with good behavior in state or federal prison. Using the images of the Prison Sentence Calculator and information below plus working in tandem with the actual calculator on the bottom of this page, we can easily figure the "guesstimated" time that could possibly be shaved off a prison or jail sentence. To note: the Jail Guide Prison Sentence Calculator does not record input or cookies or IP addresses... that's not to say if you attempt to crack it we wont find out... but it does not record usage. This calculator serves a number of purposes. We do understand that the person who is or will be convicted will be using this calculator to find out what kind of time they can expect to do, as well their family and friends. But we know that this prison sentence calculator can also help the victim of a crime, and to members of law enforcement to calculate the approximate date when an inmate will be released from prison or jail hopefully giving them some peace of mind. "Guesstimated" *** We do caution the user that this is not an exact science and that other factors are involved to compute good time credits that are beyond our control. As an example: If the user of the prison sentence calculator is sent to prison and causes a fight, is written up then this may reduce the amount of good time granted. The same goes for any other infraction received while incarcerated. 1 Choose whether you will calculate Federal Prison or State Prison sentence. Each State Prison Department of Corrections (DOC) has a different algorithm for sentence computation as does the Federal Bureau of Prisons (BOP). Federal Prison Sentence: If you select "Federal" you would need to annotate Yes or No for RDAP explained in item 2. This sentence is automatically figured as the Board Of Prisons uses only 1 calculation for good time credit. State Prison Sentence: If you select "State Prison" a drop down box will appear and you will simply choose the state of sentencing. 2 If you are choosing a Federal BOP sentence click here for "Yes". You'll notice that R.D.A.P is set to "No" automatically. This is due to not knowing if you are eligible for a drug or alcohol treatment program. If you are you might be able to shave even more time off of your incarceration. If you are eligible for R.D.A.P. (Residential Drug Abuse Program - it has longer names but we'll stick with this), then choose "Yes". You'll also notice that R.D.A.P is highlighted this is for more information as it pertains to the treatment program and facilities. 3 Often the "Date of Surrender" is not necessary when using the state prison calculation. For the Federal system you'll put in your "Date of Surrender". If you surrender at 2pm it will actually count as a full day... so its best to add this date. 4 If you had been incarcerated for any length of time, put that amount in here. This is the amount of time you have already served; such as county lockup, transfer etc. This time will be deducted from your total time. As well, it will also be counted as "good time" as this reflects your sentence as a whole. Please check with your probation officer or attorney to find out if your state has different rules about time spent being incarcerated while waiting for trial or transfer. For the Years, Months or Days you can enter any amount or figure. So if you spent 1 year in county you can put 12 in the months box. This prison calculator understands all dates. 5 This one is pretty straightforward with one exception: You can enter a number of Years and/or Months and/or Days; or simply the number of Years, or, the number of Months, or, the number of total Days... or mix up any amount. So if your sentence was 48 months you can simply put the number "48" in the months box. Or - you can put "4" in the years box or 1,460 days. 6 Once you have all of your figures entered click on "Calculate My Good Time" and the prison calculator will change showing you the results of your time to serve, your total days and your possible release date. 7 If you would like to embed this calculator on your website, blog or forum click the "Embed" button to be taken to the page to grab the code. 8 If at any time you need help with an explanation click the "Help" button and it will bring you right back to this page. 9	If you are a lawyer or bonding company and would like to advertise on this calculator on your own site we have made it possible to do so. Click the link on the calculator and you will be taken to the Jail Guide advertising page where you can find out more about ad size or text links for the prison sentence calculator. If you would like to find out how to use our prison sentence calculator freely on your website, please visit the Prison Sentence Calculator embed code page.